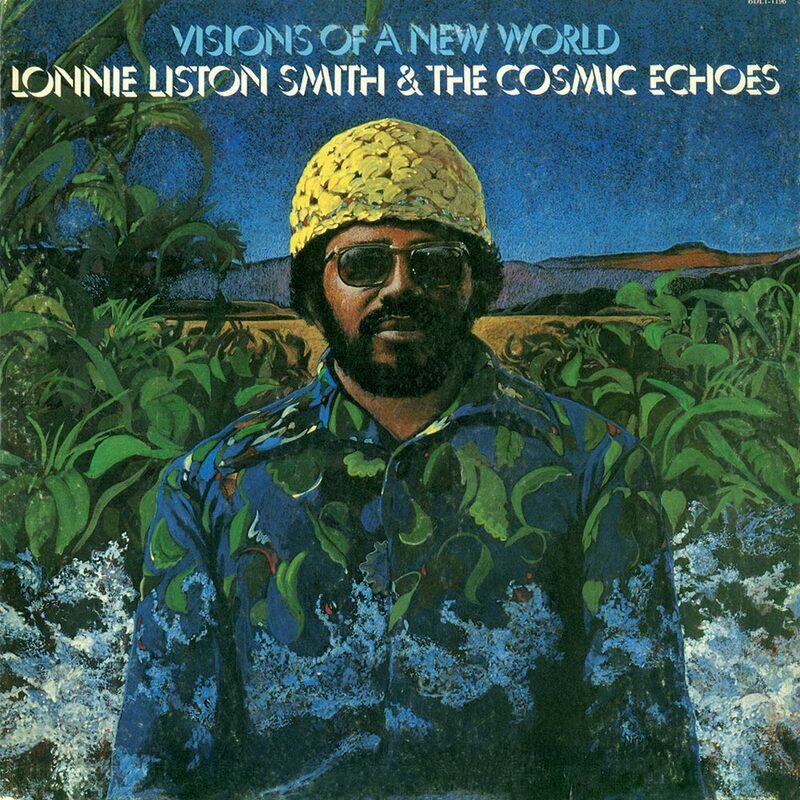 LONNIE LISTON SMITH AND THE COSMIC ECHOES-VISIONS OF A NEW WORLD. Bob Thiele understood musicians. He understood that often, a large record company wasn’t the best environment for musical pioneers and mavericks to thrive. This understanding came from a lifetime in the music industry. His career started in 1969. Thirty years later, in 1969, and Bob Thiele was one of the most powerful men in music. After eight years running Impulse, and transforming it into one of jazz’s premier labels, Bob Thiele found himself at loggerheads with Larry Newton, the head of ABC Records. It looked as if Bob’s time at ABC was coming to an end. Bob Thiele’s departure from ABC Records was announced 29th April 1969. The man that had run ABC Records’ Impulse and Bluesway was about form his own record company. Flying Dutchman Productions was no ordinary label though. It was a company where innovators, pioneers and mavericks were welcome. Bob Thiele knew, that within the right environment, innovative and maverick musicians could thrive, creating music that’s influential and forward-thinking. So, Bob Thiele went in search of innovators, pioneers and mavericks. Over the next few years, Flying Dutchman Productions became home to everyone from Ornette Coleman, through Gil Scott Heron, Leon Thomas, Eddie “Cleanhead” Vinson, Louis Armstrong and Lonnie Liston Smith and The Cosmic Echoes, who signed to Flying Dutchman Productions in 1972. 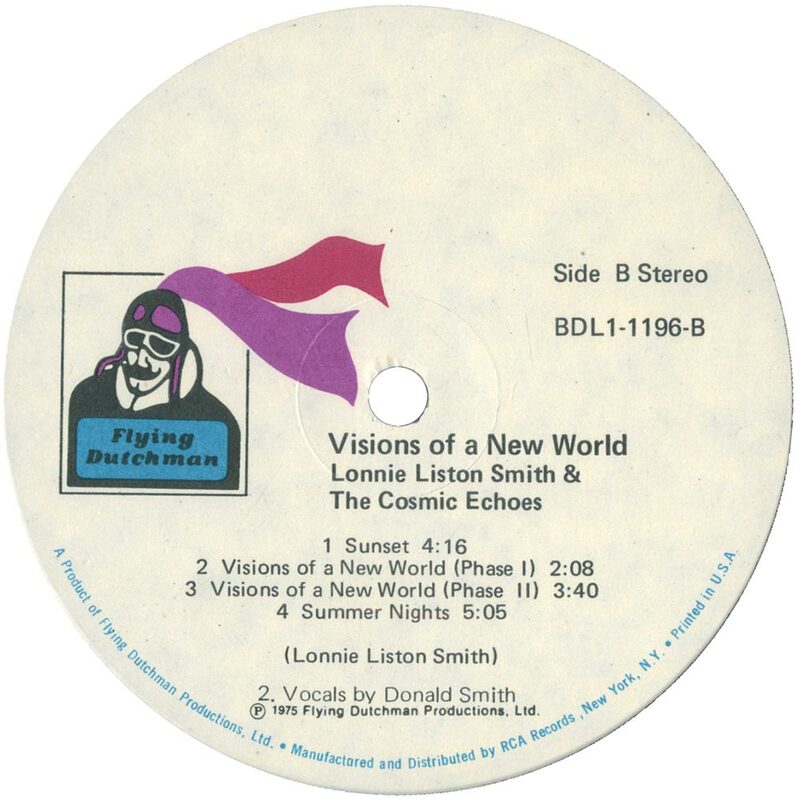 Lonnie Liston Smith and The Cosmic Echoes debut for Flying Dutchman Productions was Astral Travelling. This groundbreaking album was released in 1973, and was the first of five albums Lonnie Liston Smith and The Cosmic Echoes released for Bob Thiele’s new label. This was the start of an exciting adventure for the cosmic jazz visionary. 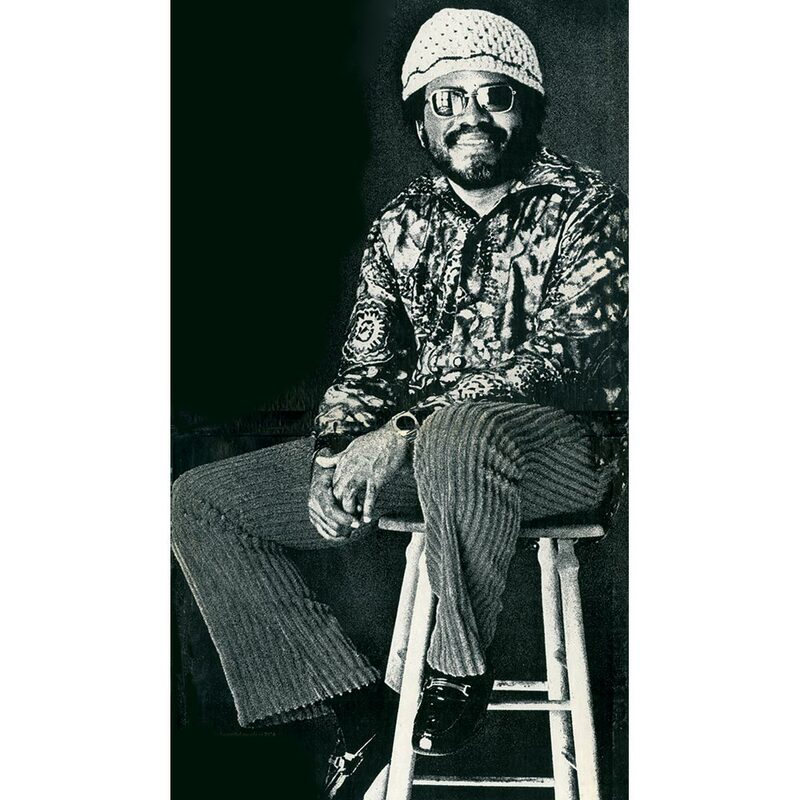 By the summer of 1975, Lonnie Liston Smith and The Cosmic Echoes were about to release their fourth album Visions Of A New World, which was recently reissued by BGP, an imprint of Ace Records. 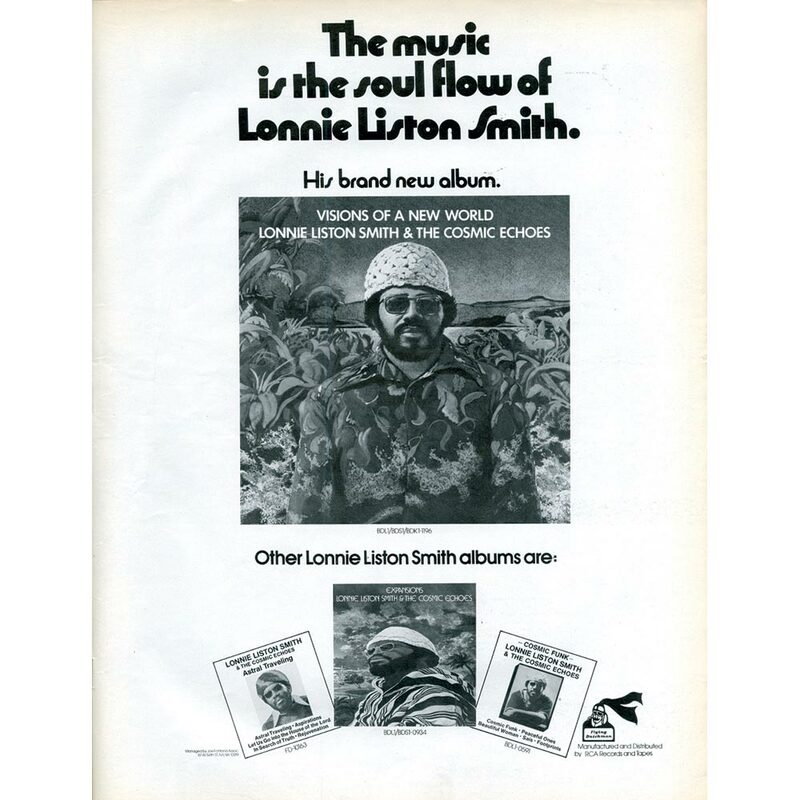 It was the followup to Expansions, which was Lonnie Liston Smith and The Cosmic Echoes breakthrough album. Expansions which was licensed to RCA, sold well, reaching number eight-five in the US Billboard 200, twenty-seven in the US R&B charts and number two in the US Jazz charts.. Radio and club DJs were also spinning tracks from Expansions. Given the success of Expansions, it wasn’t surprising that Bob Thiele sent Lonnie Liston Smith and His Cosmic Echoes into the studio to record Visions Of A New World. For the thirty-five year old Lonnie Liston Smith, he was about to grasp the nettle. This success was what he had been working toward all his life. Pharaoh Saunders had worked closely with John Coltrane right up to his death in 1967. The following year, Pharaoh formed a new band. Their music is best described as free jazz. Musical boundaries were pushed to their limits and beyond. Recognising a fellow believer in free jazz, Pharaoh asked Lonnie to join his band. Lonnie went on to play on three of Pharaoh’s best albums. The first of this trio was 1969s Karma. It was followed in 1970 with Jewels of Thought and 1971s Thembi. The other Pharaoh Saunders album Lonnie played on was 1970s Summun Bookman Umyun. which was released on Impulse. Just like the three albums Pharaoh recorded for Flying Dutchman, it was a groundbreaking album. During this period, Pharaoh and his band were constantly pushing boundaries and rewriting the musical rulebook. Their music was truly groundbreaking. Even Lonnie was challenged. On Thembi, Pharaoh asked Lonnie to play the Fender Rhodes. This was the first time that Lonnie came across an electric piano. However, he rose to challenge and wrote Thembi’s opening track Astral Travelling. Later, Astral Travelling would become synonymous with Lonnie Liston Smith and The Echoes. Before that, Lonnie would play with some of jazz’s mavericks. Lonnie was a member of Gato Barbieri’s band when Miles Davis got in touch. He wanted Lonnie to join his band. At this time, Miles’ music was changing direction. The direction it was heading in was funk. Electronic instruments were the flavour of the month for Miles and he was exploring their possibilities. However, Miles was doing this outside the studio environment. That’s why there are very few recordings of Lonnie playing alongside Miles at that time. That came later, when Lonnie would later work with Miles. Meanwhile, Lonnie decided to embark upon his solo career, and record his debut album Astral Travelling. When recording of Astral Travelling began, Lonnie had put together some of the most talented and innovative musicians. The Cosmic Echoes’ rhythm section included bassist Cecil McBee, drummer David Lee and guitarist Joe Beck. Sonrily Morgan and James Mtume played percussion and conga, Gee Vashi tamboura and Badal Roy tabla. George Barron played tenor and soprano saxophone. Lonnie played piano and electric piano on Astral Travelling which was produced by Bob Thiele. Astral Travelling was released in 1973. On its release in 1973, Astral Travelling was released to critical acclaim. This was no surprise. Lonnie Liston Smith had worked with some of the biggest names of jazz. It was akin to a musical apprenticeship. Astral Travelling saw Lonnie move from sideman to bandleader. Accompanied by some of the best and most innovative musicians, he had created an ambitious and groundbreaking album. Although Astral Travelling failed to chart, it sold reasonably well upon its release. This bode well for the future. At Electric Ladyland Studios, Bob Thiele and Lonnie Liston produced the eight tracks that eventually became Visions Of A New World. Accompanying Lonnie were The Cosmic Echoes. Their rhythm section featured bassist Greg Maker, drummer Art Gore and Wilby Fletcher and guitarist Reggie Lucas. Percussionists included Michael Carvin, Ray Armando, Angel Allende who added bongos and Lawrence Killian who also played congas. Flautist Donald Smith also added vocals on three tracks. The horn section included soprano saxophonist Dave Hubert, trombonist Clifford Adams and trumpeter Cecil Bridgewater. This was a very different lineup of The Cosmic Echoes that featured on Astral Travelling. Lonnie Liston Smith on keyboards was the only constant. This constantly evolving lineup didn’t affect the success of Visions Of A New World. Just like previous albums, critics hailed Visions Of A New World as a groundbreaking album. Lonnie Liston Smith was seen as a musical pioneer, capable of creating innovative and influential music. That music was way ahead of the musical curve. So, it’s no surprise that when Visions Of A New World was released in the summer of 1975, it reached number seventy-four in the US Billboard 200, fourteen in the US R&B charts and number four in the US Jazz charts. Visions Of A New World was Lonnie Liston and The Cosmic Echoes’ most successful album. Here’s why. 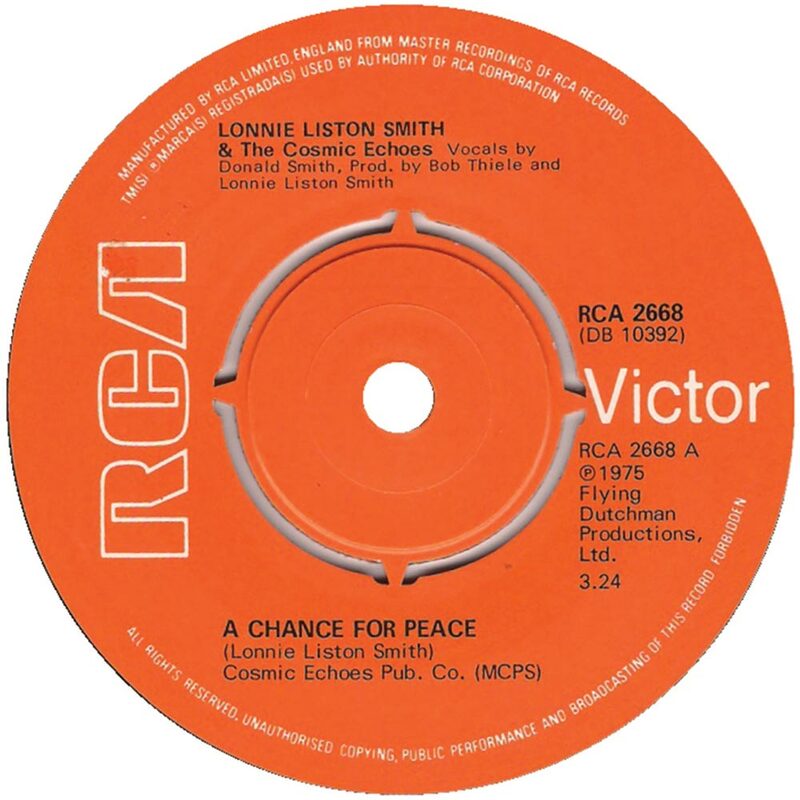 Opening Visions of a New World is one of Lonnie Liston and The Cosmic Echoes’ best known songs, the anthemic A Chance For Peace. Straight away, the rhythm section and guitar lock into a funky, bubbling groove. They’re aided and abetted by Lonnie’s keyboards, plus a myriad of percussion, congas and bongos. They provide the backdrop for Donald Smith’s impassioned, hopeful vocal. Stabs of blazing horns soar above the arrangement, as musical genres seamlessly, melt into one. Then when Lonnie steps out of the shadows, he delivers a masterclass on the keyboards. It’s Hendrix-esque. Meanwhile, the rest of the band are content to let Lonnie take centre-stage, as the uber funky arrangement flows and bubbles along. Then when Donald’s vocal returns, he combines power and passion, breathing hope and meaning into Lonnie’s lyrics. They prove as relevant in 2015, as they were forty years ago in 1975. Love Beams sees the tempo drop, and a smooth, sensual arrangement unfold. That’s the case from the moment “Love Beams” is sung. The rhythm section combine with percussion and Lonnie’s crystalline keyboards. A smooth, sultry horn sounds, before dropping out. From there, Lonnie Liston and The Cosmic Echoes take the listener on a journey to a faraway, exotic location, on this sensual, dreamy sounding track. Subtle flourishes of Lonnie’s keyboards open Colours of the Rainbow. They’re soon joined by Donald Smith’s powerful, impassioned vocal. It soars above the arrangement, as percussion accompanies Lonnie’s keyboards. They fill the spaces on what’s a quite beautiful, hopeful sounding song. Devika (Goddess) was written by Dave Hubbard and Sarina Grant. Just Greg Maker’s lone bass opens the track. It’s soon joined by drums and percussion and keyboards. However, it’s when Dave Hubbard unleashes his soprano saxophone, the track begins to unfold. Its smooths soulful sound provides the perfect accompaniment to the rest of The Cosmic Echoes. Aided and abetted by Lonnie, they create a bubbling, funky arrangement. Dave’s saxophone steals the show. Partly, it’s because of his ability to improvise. He repeats the rhythm, constantly changing things around. Lonnie delivers a brief solo, and with the help of the rhythm section, keeps the funky vibe bubbling. Lonnie then passes the baton, allowing other members of the band to showcase their skills. Then Dave delivers a quivering solo, picking up where he left off, as he plays a starring role on Devika (Goddess). With its slow, dreamy sound Sunset again, conjures up images of somewhere warm and exotic. Lonnie’s keyboards are to the fore, while the rhythm section and percussion combine. Tender harmonies are added as the arrangement literally meanders lazily along. Space is left within the cinematic arrangement, as if inviting the listener to paint pictures with their imagination. That’s not difficult given the quality of the musical backdrop. Visions of a New World (Phase I) has a big, bold introduction. It comes courtesy of Lonnie’s rumbling piano. Soon, it gives way to Donald Smith’s impassioned vocal. It’s delivered powerfully, and soars high above the arrangement. For two minutes, Lonnie and Donald combine. However, a change is coming. It comes on Visions of a New World (Phase II). The tempo rises as a funky rhythm section join Lonnie’s keyboards. They take the arrangement in the direction of fusion. Later, horns are added. As one, they blaze above the arrangement. It’s augmented by percussion, bongos and congas. This is very different from Visions of a New World (Phase I). The tempo has risen, and the experimental, free jazz sound is replaced by a hard, driving slice of fusion. It features Lonnie Liston and The Cosmic Echoes stretching their legs, and showcasing their considerable skills. Closing Visions of a New World was Summer Nights. Lonnie’s keyboards dominate the introduction, before the rest of the band are counted in. They create a slow, smooth and meandering arrangement. It comes courtesy of Lonnie’s keyboards, percussion, bongos and congas. Providing a subtle heartbeat are the rhythm section. When all this is combined, the sultry sounding Summer Nights glides along, and proves the perfect way to close Visions of a New World. Summer Nights features Lonnie Liston and The Cosmic Echoes at their creating timeless music. Forty years after Lonnie Liston and The Cosmic Echoes released their most successful album, Visions of a New World, the album sounds just as good, as it did in 1975. Visions of a New World is a timeless album. That’s the case with so much groundbreaking music. Not only was Visions Of A New World groundbreaking, but commercially successful. That isn’t always the case. Lonnie Liston and The Cosmic Echoes first two albums didn’t sell in vast quantities. Neither 1973s Astral Travelling, nor 1974s Cosmic Funk charted. It wasn’t until the release of Expansions in early 1975 that commercial success came Lonnie Liston and The Cosmic Echoes’ way. However, Bob Thiele held his nerve, and continued to believe in Lonnie Liston and The Cosmic Echoes. Bob Thiele was rewarded when Expansions reached eight-five in the US Billboard 200, twenty-seven in the US R&B charts and number two in the US Jazz charts. Other labels wouldn’t have been as patient as Bob Thiele. However, he believed in Lonnie Liston Smith, a music innovator who was way ahead of the musical curve. His patience was rewarded again, when Visions Of A New World became Lonnie Liston and The Cosmic Echoes’ biggest selling album. When Visions Of A New World was released in the summer of 1975, it reached number seventy-four in the US Billboard 200, fourteen in the US R&B charts and number four in the US Jazz charts. Visions Of A New World was Lonnie Liston and The Cosmic Echoes’ became most successful album. No wonder. The music on Visions Of A New World oozed quality. Elements of free jazz, funk, fusion, rock, smooth jazz and soul are combined on Visions Of A New World. As a result, the music was innovative and guaranteed to influence other musicians. Lonnie Liston Smith was a leader, not a follower. He released five albums on Bob Thiele’s Flying Dutchman Productions. Each of these albums feature a musical visionary at the peak of his creative powers. One of Lonnie Liston and The Cosmic Echoes’ finest albums is Visions Of A New World, which was recently reissued by BGP, an imprint of Ace Records. Visions Of A New World, which is a truly timeless album, along with Astral Travelling, is the perfect introduction to cosmic jazz pioneer, Lonnie Liston and The Cosmic Echoes. ← SWAMP DOGG-I’M NOT SELLING OUT/I’M BUYING IN.